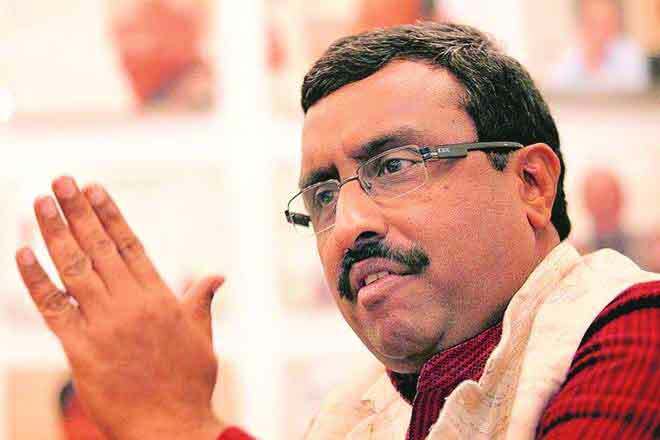 Senior BJP leader Ram Madhav on Wednesday said if the court judgment on Ram temple is not concluded early, the BJP would explore “other options”. The statment has come a day after Union Law Minister Ravi Shankar Prasad urged the Supreme Court to fast-track the hearing in the Ayodhya title suit. The temple fire is receiving more fuel as Lok Sabha polls draw closer and the apex court is to decide on the hearing of the title suit on January 4 in the “Mandir-Majid” dispute. Facing a tough election fight in 2019 elections, the ruling BJP, with a good prompting from the RSS, is keen to push the temple agenda, particularly in Uttar Pradesh. Madhav’s comment that his party may go for “other options” goes on to confirm the BJP’s pursuit of the Ram temple issue and its determination to make it a campaign plank. As a precursor, the Yogi-Government in UP has already decided to rename Faizabad as Shri Ayodhya district. “Option of Ordinance has always been there. But matter is right now in the SC, and the SC has given a date of January 4 to decide about next Bench. We hope the SC will take it in fast-track way and conclude it early. If that’s not going to happen, we’ll explore other options,” the BJP general secretary said in a tweet. Law Minister Ravi Shankar Prasad had on Wednesday requested the SC to resolve the Ram Mandir issue at the earliest and sought to cite its quick verdict on adultery and Sabrimala. “I want to make an appeal, not as a Law Minister but as a citizen. A lot of evidence is available and this is the best part. People come to me and ask me when adultery case can be heard in just six months, the court can resolve the Sabarimala issue in 6 months, urban Maoist case can be heard in two months… our Ram Lalla dispute is pending for the last 70 years and in the SC, the appeal is pending for the last 10 years, why there is no hearing?” he said. On another political question, Madhav accepted that the Congress president scored some political victories but refused to comment on the merit of his leadership. “Rahul Gandhi is leader of Congress. It’s for them to decide if his leadership is beneficial to them or not. How can we comment on his leadership for Congress? He tried his electoral mettle in recent polls and brought some victories to Congress, there’s no doubt about it,” said the BJP leader. Madhav further sought to qualify his praise for Rahul by not seeing him as prime ministerial candidate from the Opposition side. “If Rahul Gandhi could’ve been option for PM candidate because of recent victories, then there would’ve been no need for mahagathbandhan. Even today, no one, except Stalin, is ready to confirm name of the leader of mahagathbandhan. There are six people in queue to become PM”, he went on to say to suggest that Opposition is still in disarray in so far as the choice of PM candidate is concerned.